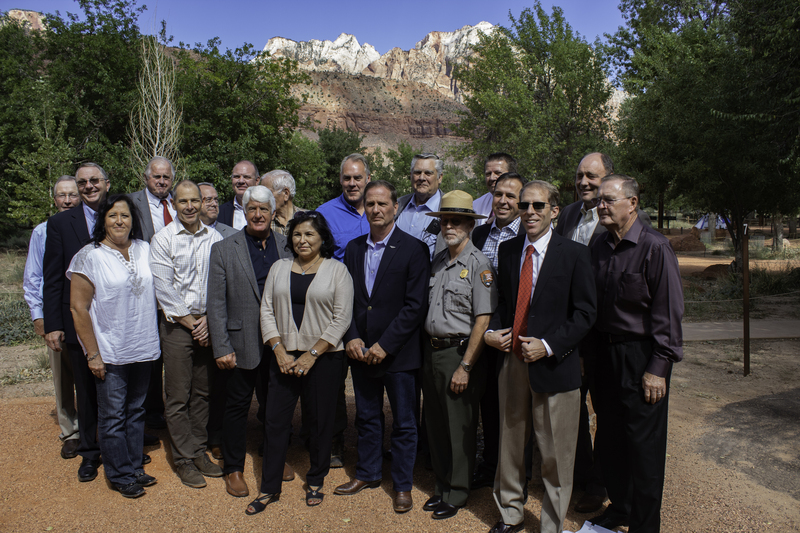 ZION NATIONAL PARK — Secretary of the Interior Ryan Zinke, along with three Utah congressmen, visited Zion National Park Monday to address the nearly $16 billion in deferred maintenance backlog across national parks, public lands and fish and wildlife services. Rep. Rob Bishop, R-Utah, is sponsoring a bipartisan bill, H.R. 6510, Restore Our Parks and Public Lands Act of 2018, along with co-sponsors Rep. John Curtis, R-Utah, and Rep. Chris Stewart, R-Utah. Rep. Mia Love, R-Utah, also is a co-sponsor, but did not attend the Zion event. The bill would allocate federal energy revenue to pay for the deferred maintenance backlog for things like road and facility upkeep as well as issues related to public health and visitor safety. Some $12 billion of the deferred maintenance is from national parks, and $1.3 billion is backlog from the wildlife refuges, he said. The remainder is related to other public lands, such as the Bureau of Land Management, and Native American education. Utah’s’ maintenance backlog totals about $260 million, with Zion accounting for about $65 million of that. About half of the backlog is because of roads, Zinke said. And not all of the roads are on park property. Approximately one-third of them are gateway roads allowing access to the park that the park service is responsible for maintaining. Much of the wear on parks is due to years of visitor use, which has been increasing. About 330 million people visited national parks last year, 10.5 million visitors in Utah. Stewart attributed the increase to a cultural shift, not a larger population, as younger generations are becoming more interested in the outdoors. Being able to accommodate the increasing number of visitors is one of the reasons Stewart said he proposed a bill to turn Grand Staircase-Escalante National Monument into Utah’s sixth national park. Deferring maintenance ends up costing more than performing the maintenance in a timely way, Curtis said. The cost of deferred maintenance increases 2 percent annually. Not only would the bill save money but would contribute to visitor safety and a good park experience. The funds would come from all sources of federal energy revenue, including natural energy sources like wind and solar, as well as fossil fuels sourced in the U.S., Zinke said. The bill is also designed to pay for deferred maintenance without raising taxes or increasing government, Bishop said. The money that would be allocated is currently going to general funds in the U.S. Treasury. The bill is constructed so that deposits to the fund are authorized for five years and are capped at $1.3 billion annually so that park projects are guaranteed enough money to be completed, he said. Not only would the bill help pay for national parks and public lands, but it would go toward improving facilities for the Bureau of Indian Education. “They deserve a world-class education, too. 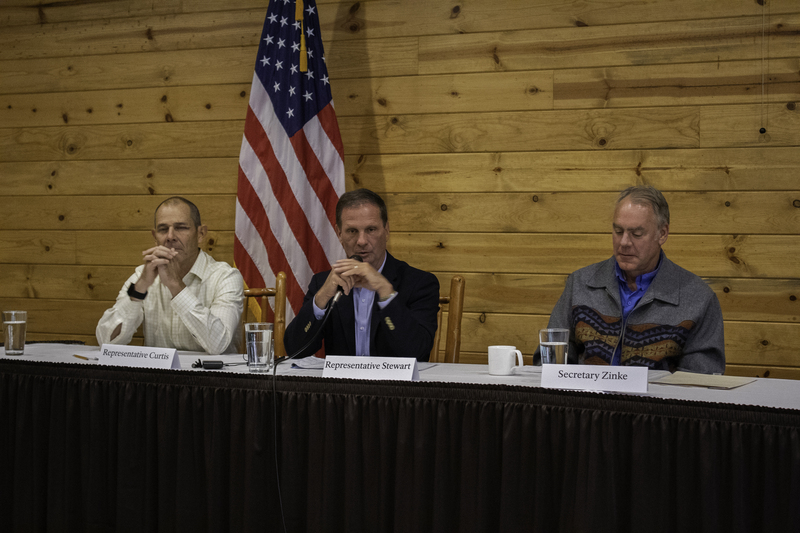 And if you look at some of the facilities, they’re shameful,” Zinke said. In Zion, 42 percent of the backlog is due to roads, parking and tunnels; 31 percent for buildings; 11 percent for maintaining landscapes, 9 percent for trail and bridges upkeep; 5 percent for water and wastewater systems; and 2 percent for other issues Superintendent Jeff Bradybaugh said. Zion officials are specifically concerned with visitor safety and experience. Roads, transportation, building upkeep and maintaining trails are considered top priority, Bradybaugh said. Some of the park facilities were built decades ago and are not up to code for accessibility, water or electric. 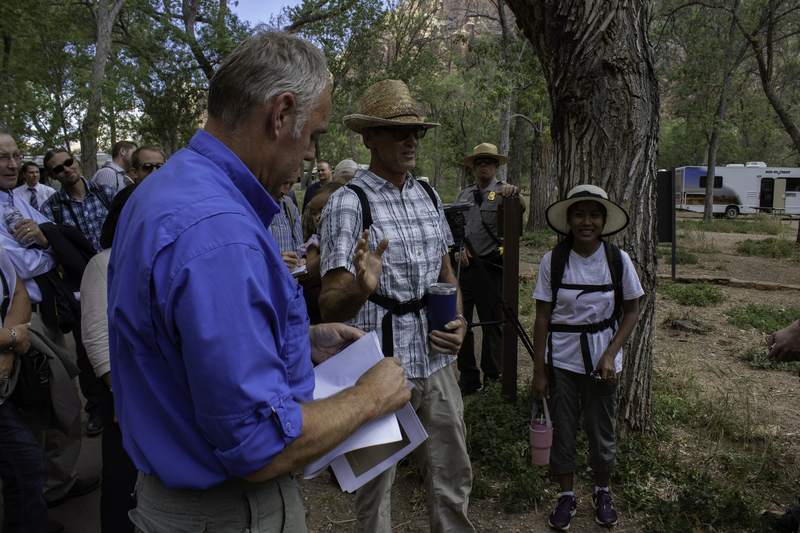 Zion officials have plans for upkeep in the park, but are looking to not only maintain but improve the park and visitor experience by working with both government and nonprofit organizations like the Zion Forever Project. One long-term proposal is to rehabilitate the South campground. The Watchman campground was renovated to provide upgraded facilities, new, larger restrooms and better camping spots, Zion facility operations specialist Treacy Stone said. Zinke, Bishop, Stewart and Curtis, along with several local elected officials, visited both campgrounds to see the difference firsthand. The South campground project would redesign the road to make it easier to navigate, build three new restrooms and restore the historic restroom, add a picnic area with 15 sites, replace utility lines and make the entire campground more accessible. The project will cost almost $8 million and is planned to be constructed in 2022. Vince and Thary Boling, along with their 1-year-old daughter Elianna from Graton, California, spent one night in the Watchman campground before spending their second night in the South campground. “We were surrounded by the same beauty, however, there’s some safety concerns for her just around our campground. It’s not as well maintained, obviously, the bathrooms are nowhere near as nice,” Vince Boling said. If the bill is passed, distribution of funds has already been prioritized based on public safety, environmental compliance and public health. Zinke is confident that the bipartisan bill will pass. “Parks are not a Republican or Democrat issue. Parks are an American issue,” Zinke said. Don’t be fooled. Zinke is tossing crumbs to the park system based on allowing exploitation of millions of acres for mining and energy development. Tourism is this state’s richest resource. The NPS backlog has been going on for years and both sides of the political aisle are to blame. The Democrats keep creating parks and monuments, creating a bigger backlog, and the GOP says there can be no new parks and monuments until the backlog is taken care of while they refuse to fully fund taking care of it. It is a big game and our National Park System, one of the crown jewels of our American system, suffers for it. Create more parks and monuments, yes. But at least have the political guts to fully fund the backlog and infrastructure for existing and new units. Enjoy your visit to Springdale folks, as the Zion National Park Main parking lot fills to capacity by 7am eachday! Oh, and don’t forget to pay, or you’ll get a ticket or towed…Oh, haven’t heard of the new parking fee’s?…here you go! Beginning on Monday, April 16, visitors to Springdale should anticipate paying to park on the street. Parking rates will be $1 for the first hour of parking and $3.50 for each additional hour, or $22 to park all day long. Revenue from the paid parking program will be used to make continued improvements to the transportation and parking system for the benefit of Town residents and visitors alike. The Town anticipates funding projects such as regional public transit, additional pedestrian and bicycle facilities, off-street parking areas, and other transportation improvements with the parking revenue. Paid on-street parking will be enforced seven days a week, from 6am to 6pm. The Town asks visitors to obey all “no parking” and “permit parking” signs. The Town will issue parking citations to vehicles parked in a no parking area, in a residential permit parking area without the appropriate permit, in a paid on-street parking zone without paying the required fee, and in other situations that violate the Town’s parking ordinance. The Town further requests that visitors respect “customer only” and “patron only” parking signs at local businesses. Springdale Town residents are eligible for residential parking permits. Residential parking permits will allow unlimited on-street parking on streets designated as residential permit parking areas.